During Apples October event, the company announced an update to the Mac mini. 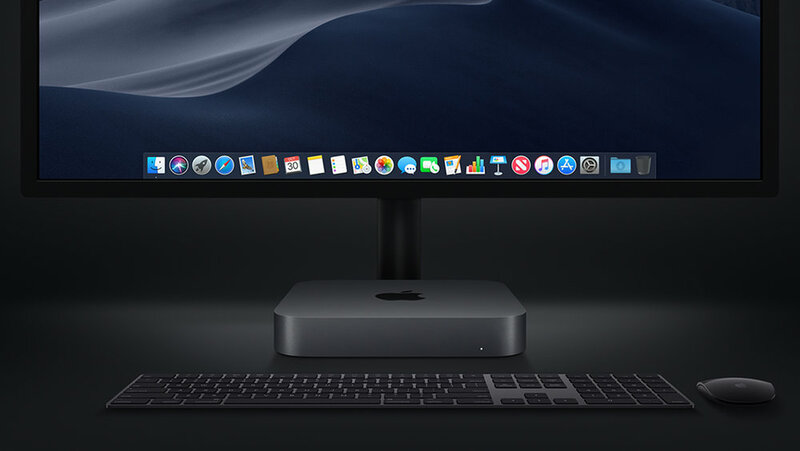 The new space gray Mac mini starts at $799, and is available for order today for delivery or pickup at Apple retail stores as early as November 7. The base model of the Mac mini comes with a 3.6GHz quad-core 8th-generation Intel Core i3 processor, 8GB of 2666MHz DDR4 memory, Intel UHD Graphics 630, and 128GB of PCIe-based SSD storage. That model can be configured with a 3.2GHz 6-core 8th-generation Intel Core i7 with Turbo Boost up to 4.6GHz, up to 64GB of RAM, up to 2TB of SSD storage, and 10 Gigabit Ethernet. If you went with all of the top end options, that little Mac mini goes up to $4,199, that’s without a keyboard, pointing device or monitor. The higher-end Mac mini starts with a 3.0GHz 6-core 8th-generation Intel Core i5 processor with Turbo Boost up to 4.1 GHz, 8GB of 2666MHz, DDR4 memory, Intel UHD Graphics 630, and 256GB of PCIe-based SSD storage. Configure-to-order options include that same 3.2GHz 6-core Intel Core i7 chip with Turbo Boost up to 4.6GHz, RAM up to 64GB, storage up to 2TB and 10 Gigabit Ethernet. Oddly enough, maxing out this model of the Mac mini gives you a lower price tag of just $3,999 for exactly the same specs as the maxed-out base model. 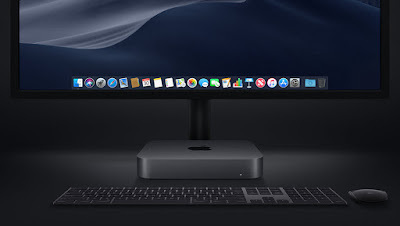 Apple notes that the new Mac mini delivers five times the performance of previous models, and that the device comes with the T2 security chip for real-time encryption of data. The Mac mini has always been a very versatile Mac, with lots of ports in the back. The new version gives you four Thunderbolt 3 (USB-C) ports, an RJ-45 Ethernet port, HDMI 2.0 out, two USB 3 ports, and a 3.5 mm headphone port. What’s great is that Apple has made the RAM in the new Mac mini user-replaceable so that users have a choice to purchase RAM upgrades from lower-cost third parties. At this time, we don’t know if the SSD is user-replaceable or not.